At the end of our Pt.7 update our VW Caddy project needed a few final details wrapped up before it was ready to come home. It was also finally time to install some parts we’ve been saving for last. The last of “phase 1”, that is. A while back, a co-worker spotted a 4-door VW (Mk1) Rabbit at a local wrecking yard with some vent windows and yanked those out for us. We returned a week later to grab the front grille to replace our broken one, a fresher set of window/door scrapers and seals, and some miscellaneous interior pieces to include a much needed rear view mirror and e-brake boot. The stock license plate light assemblies and bulbs needed replacing, and rather quickly as we were anxious to get this thing on the road. While shopping on Amazon.com we spotted LED thread-in lights that were low profile and less of a “distraction” like the factory pieces, a cleaner look. And at only $7 shipped we couldn’t go wrong. Hella Supertones were also picked up on Amazon.com and solves our lack of a horn, and then some. It was tough resisting the urge to install the OMP Racing steering wheel the second we picked it up but we endured. We are excited to see it finally in place. The guys at Euro Glass across the street from the shop put in the original rear glass that we cleaned up and had stored away since we took possession of the truck. On Thanksgiving Day, with our Mk4 Golf 1.8T following in support, we drove the Caddy home! It felt good to finally see it parked in the driveway. 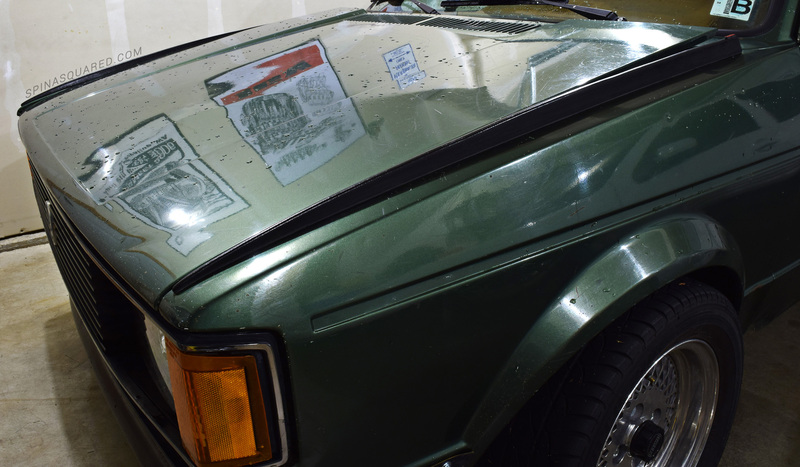 To satisfy a lingering craving to tinker that long Thanksgiving weekend, we grabbed the rare set of NOS Formuling fender spoilers we picked up at the start of this project and found they follow the angle of our raised hood. In our opinion it compliments the look so we replaced the decades-old adhesive and attached them to the Caddy’s fenders. On the weekends since, we’ve been anxious to see if any projects might require the use of our new work truck but have yet to put it to good use. (That is, until today – more on that in our next post.) A few drives around the block happen from time to time so that will have to suffice for now. We did return to Euro Glass this last week to replace the front windshield that had a crack spanning the full length of it, and right in the line of sight. But we’re not done! Next up we will need to pull the fuel filler neck as we are sure it has a hole or two. As long as we don’t fill the tank all the way, it’s a non-issue and gives us an opportunity to enjoy it before it goes under the knife again.